Traditional concepts of Federal and State law provide the current framework under which the internet operates. However, due to the inherent worldwide reach of the world wide web, unique problems are often encountered when establishing rights and duties on line. We can help. 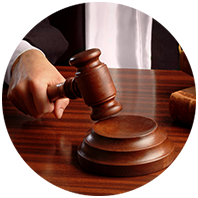 Traditional concepts of Trademark law control the rights and duties of domain name holders. By and large, the owner of the registered trade mark has the right to use any domain name which is identical or confusingly similar thereto. However, due to the international reach of the Internet, and the special problems that presents, special procedures are available to owners of trademarks and domain names who believe that a third party has registered a domain name that infringes upon their rights. ICANN ( The Internet corporation for assigned names and numbers) has been entrusted with administering an expedited domain name dispute resolution service. The question of copyright ownership and infringement is a particularly live issue in cyberspace. The web has seen an explosion in infringement actions. In essence, the general principles of copyright law are a as applicable to the web as they are in any other arena. Due to its worldwide reach it is not always apparent which court has jurisdiction over the acts of parties in cyberspace. The very nature of the internet has stretched traditional concepts of jurisdiction. For example, if a webmaster in Florida uploads copyrighted images, owned by an individual in California, to a server based in Colorado, which are viewed by individuals in France, where can the copyright owner file a lawsuit? California? Florida? Colorado? or France? The answer to this question is not always clear and depends on a plethora of factors. Consult a California computer attorney. Linked to the question of Jurisdiction and venue is the question of which state or indeed countries laws apply in cyberspace. Any failure to address this issue could expose webmasters, operators, owners and even hosts to civil and even criminal liability. For example, when would the US based owner of a Cayman Islands based on-line casino become subject to gaming laws in the US? once more this is a complex question which would depend on the precise factors and circumstances at play. The information contained in this site is provided free of charge. It is intended for informational purposes only and should not be construed as legal advice or a substitution for obtaining legal advice from an attorney licensed in your state. The transmission of information on this website is not intended to create, and its receipt does not constitute, an attorney-client relationship. For personal legal advice, please consult your California computer attorney.